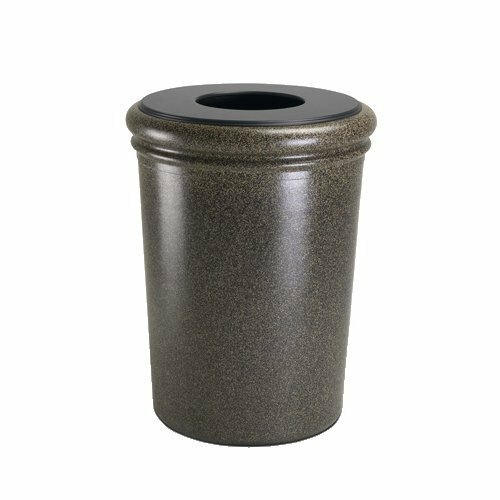 Large-capacity trash receptacle with durable pull-out plastic liner is ideal for high-traffic areas. Real stone with a unique satin finish creates an upscale look with a smooth surface for easy cleaning. Lid attaches to base with a security cable and is made of durable fabricated ABS. Made from durable, fiberglass-reinforced polymer concrete in a contemporary round design; wipes clean with just soap and water. Easy lift-off lid conceals trash for a clean appearance. Grab Baga,, system holds trash bag in place, uses 55-gallon trash bag. Base-to-lid security chain. Ships on a skid; special shipping requirements may apply. Made in USA. If you have any questions about this product by Commercial Zone, contact us by completing and submitting the form below. If you are looking for a specif part number, please include it with your message.